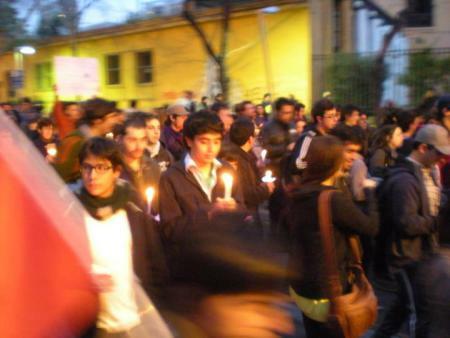 Students don black and light candles in honor of the victims of the Juan Fernández plane crash. “We wanted to make this peaceful and beautiful in memory of the people who died in Juan Fernández,” explained Priscila Hudson Saravia, education student at the Universidad de Chile, referring to the plane crash of Friday Sep. 2, in which 21 died. This entry was posted in Education, Sitio Quiltro and tagged Chilean student movement on September 8, 2011 by joehinchliffe. Mass kissings in Santiago and around the world demonstrate students passion for education reform. This entry was posted in Education, Sitio Quiltro and tagged Chilean student movement on September 1, 2011 by joehinchliffe. 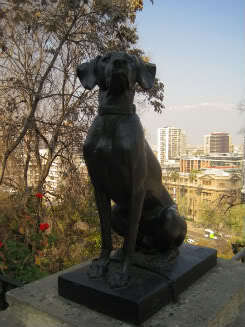 This entry was posted in Education, Sitio Quiltro and tagged Chilean student movement on August 23, 2011 by joehinchliffe. CNN put the number of marchers at around 50,000, organizers at 100,000, but there was no disputing some figures. Below 6°C, sleet, patches of snow, wind and rain. This entry was posted in Education, Sitio Quiltro and tagged Chilean student movement on August 18, 2011 by joehinchliffe.